When I went to Italy this October just before my imminent trip to India, my dad pulled out of his bag-from-the-past an object that really surprised me, just when I was starting to think my parents could no longer surprise me. 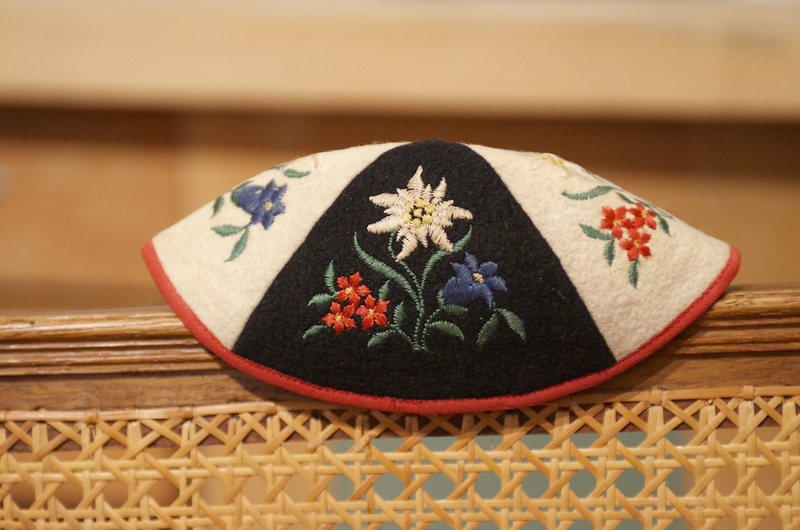 After a customary huge meal, my dad put on the table a bizarre skull-cap with sown on floral decorations, a baffling pattern describable as a blooming Alpine-Judaic mixture. Was this the time for big family revelations? Were we the only remaining survivors of forgotten Alpine Hebrew descendants? While my fantasies evidently roamed freely in my head, my dad gives me a brief, but truly touching explanation. My Grandmother’s family relocated in South Tyrol after the war. Her family was exiled from their native Rijeka in the Istrian Peninsula. My Grandmother loved the Alps, although a bit bitter about the exiled bit, my dad a bit less. And so I shall take it with me to India.